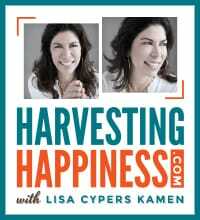 Lisa Cypers Kamen, MA, is an internationally recognized applied positive psychology coach, author, speaker, documentary filmmaker, and the creator and host of the popular radio show Harvesting Happiness. Lisa’s global practice focuses on addiction as well as trauma and life-crisis recovery to help clients balance their minds, bodies, and emotions, create greater overall well-being, and transform Post-Traumatic Stress (PTS) into Post-Traumatic Growth (PTG). She is a frequent radio, television, and print media guest expert, TEDx presenter, and contributor to the Huffington Post, Positively Positive, and Inspire Me Today websites. Other works by Lisa Cypers Kamen include the documentary film H-Factor . . . Where Is Your Heart? ; Harvesting Happiness for Heroes: Reintegration Strategies for Depression, Anxiety, Anger, Grief and PTSD; and Perspectives on Addiction: A Multi-Stepped Journey to Wholeness. Lisa lives with her family in Southern California.